Ukraine’s Naftogaz has paid Gazprom $15 million for gas delivery. 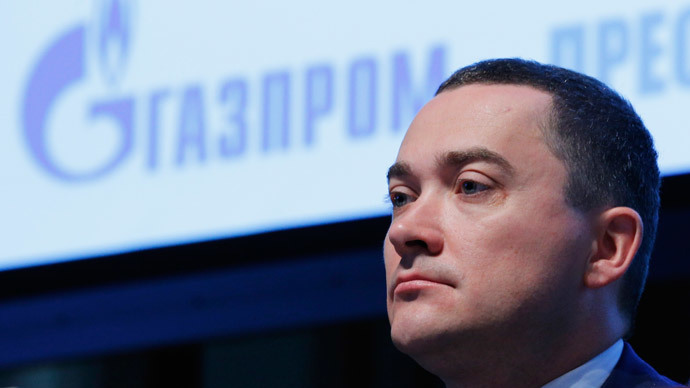 At current levels, the prepayment covers one day's gas consumption and will be spent by Tuesday, Gazprom spokesperson Sergey Kupriyanov said. “Today at 9:20am MSK Gazprom received a payment from Ukraine’s Naftogaz in the amount of $15 million. At the current level of supply this sum will be enough roughly for one day,” he said. "If Naftogaz paid for another 24 hours, it means the resources would last through Monday till Tuesday," he said. The relatively small prepayment suggests Kiev is buying time before trilateral talks in Brussels on march 2nd. Russian energy minister Alexander Novak had warned Kiev’s failure to pre-pay would mean a cut-off. In a letter sent to Gazprom late Wednesday, Naftogaz said it had a total of 206 million cubic meters of Russian gas pre-paid. "The concerns and worries are caused first of all by the fact that not much prepaid gas is left. If there is no money the supplies will stop starting from Tuesday," Russian Energy Minister Alexander Novak said Friday, as cited by TASS news agency. "The payment should be completed Friday so that the gas is supplied starting from Tuesday," Novak said. "If there is no payment there will be a break in gas supplies to Ukraine. The European consumers will fully receive gas." “We are worried about the situation with the problem of prepayment for the gas delivery. On Friday morning, the rest of the gas, prepaid by Ukraine, accounted for 123.8 mln cubic meters. Taking into consideration the fact that on the average we supply [Ukraine] with 42 mln cubic meters, without DPR and LPR [Donetsk People's Republic and Lugansk People's Republic], in fact, the remains of the gas will be enough only for Friday, Saturday, and Sunday,” Novak said, according to RIA-Novosti. In a new gas standoff, deliveries to the conflict-plagued Donbass region have become a new bone of contention between Russian and Ukraine. Last week Kiev suspended deliveries to the area, citing damage to the pipeline. Russia then launched a separate gas supply to Donbass, with President Vladimir Putin saying that cutting the war zone off gas “smells like genocide.”Gazprom said Thursday it was ready to separate gas supplies to Ukraine and Donbass. Ukraine also accuses Gazprom for breaching the contract terms, insisting Russia was delivering less then Kiev requested. It said that on February 22 and 23 it received 47 million and 39 million cubic meters respectively, while it asked for 114 million cubic meters. Gazprom says it fulfills all of its contractual obligations. The data from Ukrainian gas transmission system operator Ukrtransgaz shows that Ukraine collected 488,106 million cubic meters of Russian gas in December last year, which increased to 920,314 million in January, and soared to 772,272 billion cubic meters between February 1 and February 25 this year. The gas row comes as Ukraine’s economy plunges into a full-blown crisis. A year of Maidan unrest dragged GDP to -6.5 percent last year and saw the national currency, the hryvnia, lose about 75 percent.Naftogaz head Andrey Kobolev also admitted that his company has been teetering on the brink of bankruptcy since 2009. Earlier this month, the International Monetary Fund (IMF) agreed to provide a $17.5 billion bailout package to Ukraine, which requires Kiev to reform its economy and cut expenses.